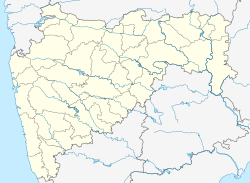 Manmad pronunciation (help·info) is one of the towns in Nasik district in the state of Maharashtra in India. It is the third largest city in Nasik district, with a population of approximately 80,000. Geographically it lies within Nandgaon Tehsil in Nashik District. Though it is bigger in area as well as in population compared to most of the Tehsils in the district, it does not have a Tehsil office. Manmad houses the largest grain storage warehouses of Asia which are administered by Food Corporation of India, and also the offices of petroleum companies like Bharat Petroleum, Hindustan Petroleum and Indian Oil. This is predominantly Railway town. All development in the city took place around railway activity. The city also has a popular Sikh Gurudwara. Manmad is one of the largest markets for onion producing farmers after Lasalgaon; many farmers from nearby villages sell their farm produce in Manmad to wholesale traders, who in turn sell it in Mumbai. The Central Railway Engineering workshop at Manmad, which constructs and maintains railway bridges for central railways, marked 100 years of operation in December 2005. The Centralized Engineering Workshop is under the direct control of Chief Engineer, Central Railway, Mumbai. This workshop undertakes fabrication of steel structural items, including bridge girders (the longest span built so far is 400 ft or 122m – KRCL); approximately 1160 employees work in the Engineering Workshop. Bharat Petroleum has installed a station near Manmad which collects the petroleum products from BPCL & HPCL refineries and carries to interior part of Maharashtra. The petroleum products are loaded in rail wagons and transported to other places. Manmad railway station is a major railway junction on the Central Railway line. There are four railway lines converging at Manmad, one each from Bhusawal, Daund-Pune, Secunderabad-Manmad and the most important one from Mumbai. Manmad is a very crucial junction for all those who want to travel to Shirdi, Pune, Mumbai, Hyderabad, Tirupati, Konkan, Marathwada and Bangalore. It is a city with a majority of its population employed by Central Railway and Food Corporation of India. This station served as important inter-connection between Nizam State Railway (then Metre Gauge railway) and GIP Railway till 1948. Gurudwara is the major attraction of the place that catches the attention of travellers and makes people spellbound. The beauty of the Gurudwara is so amazing that people love to spend hours and hours in peace and calmness. One more place you must visit is Nageshwar Temple, Nagpur (4km from Manmad), the place as the image of the deity is quite beautiful. The Ankai Fort and Tankai Fort (900 ft tall and situated at a height of 961 m - 3125 ft above sea level) of Satpuda/Chandwad range are situated about 8 km south of Manmad, perfect example of mesas and buttes form of dissected plateau. There is Agastya Rishi temple located nearby. There is Waghdardi Dam near City to address water demand of the city. "Hadbi chi Shendi" the place that holds the attention of travellers. This peak looks like a thumbs up sign and is 150 ft tall. The beauty of this peak catches the attention of travellers. Near by manmad shingave is a small town in December on God Datta's birth anniversary there is big Jatra. Originally the Manmad town lies on Malegaon - Manmad - Ahmadnagar - Pune Road. It was important link for Holkars to deal with Peshwas at Pune. It was important link for Peshwas for entering Northern India and especially Delhi. Other roads link with [[Chandwad]] and Nandgaon. The city has huge traffic of agricultural produce, transport of petroleum, food grain & cement from Manmad Station. Traditionally (before the 1960s), Nashik district faced acute shortage of food grains. Food grains from Marathwada region were transported through this town, destined to Nashik district. Manmad is located at 20°15′N 74°27′E﻿ / ﻿20.25°N 74.45°E﻿ / 20.25; 74.45. It has an average elevation of 580 metres (1902 feet). As of 2011[update] India census, Manmad has a population of 80,058. Males constitute 52% of the population and females 48%. Manmad has an average literacy rate of 75%, higher than the national average of 59.5%: male literacy is 81%, and female literacy is 69%. In Manmad, 13% of the population is under 6 years of age.